The Province of Manitoba enacted a 2‐year moratorium on new peat mines in the province as part of the Save Lake Winnipeg Act June 2011. Some peat mines received licenses without First Nations consultation, and over objection of the Aboriginal Relations Branch in Manitoba Conservation. Two proposed peat mines are located within Peguis First Nation’s Community Treaty Land Entitlement (TLE) Notification Zone. Other nearby First Nations, such as Fisher River First Nation, have also raised objections to the peat mines. Cottagers and others have appealed these peat mine licenses. Peat is thick water‐logged organic soil layer made up of dead and decaying plant material. Peatlands include moors, bogs, mires, peat swamp forests and permafrost tundra. Peatlands act as important water filters, reducing harmful nutrients that enter the lake. Peatlands are moose habitat and provided us with medicinal plants. Peat bogs also serve as important carbon sinks. Mining them releases both carbon and methane into the atmosphere. Peat is used in agriculture where it is mixed into soil to improve its structure and helps retain moisture. It is also used in water filtration. Most of the peat mined in Southern Manitoba goes to the USA market for gardens, greenhouses, orchards, etc. Sun Gro Horticulture (Canada) Inc. applied to Manitoba Conservation for an Environment Act license to develop peat‐mining operations on 1170 hectares of crown‐owned land in the Ramsay Point Bog (located 40km northwest of Riverton) December 9, 2010. On June 29, 2011 just a\er the moratorium started, Sun Gro was granted Environment Act license 2964. Peguis First Nation appealed this license to the Minister of Conservation and Water Stewardship. Berger Peat Moss Ltd. applied to Manitoba Conservation for an Environment Act license to develop peat‐mining operations on 2257 hectares of crown land in the Deer Lake Bog (located 60km north of Riverton) February 25, 2011. On July 20, 2011 Berger was granted Environment Act license 2964. Peguis First Nation appealed this license been to the Minister of Conservation and Water Stewardship. Both peat mines received licenses without First Nations consultation, and over objection of the Aboriginal Relations Branch in Manitoba Conservation. The two proposed peat mines are located within Peguis First Nation’s Treaty Land Entitlement (TLE) Notification Zone. Other nearby First Nations, such as Fisher River First Nation, have also raised objections to the peat mines. Peguis First Nation has advised the Manitoba government about discovery of several sacred artifacts buried at the Sunterra peat mine operation inside Peguis traditional territory and treaty land entitlement notice area. Treatment of these artifacts has been described as sacrilegious, showing little or no respect for the spirituality of Anishinabe Peoples. First Nation lands and resources are not protected by the Manitoba government, and it seems nor are these sacred artifacts. The Manitoba Heritage Act requires work to stop at the mine, and the site to be assessed, and inventoried. Artifacts recovered to date are held in a secure and respected institution. The current licence issued to Sunterra Horticulture was processed in a manner that contravened the Crown’s duty to consult and accommodate. Accordingly this means the honour of the Crown was not upheld. Sunterra Horticulture is also seeking an environmental licence for a significant expansion of its operations nearby. The expanded vacuum peat mining operation would impact Peguis First Nation’s ability to exercise its rights, including for treaty entitlement land selection. The Sunterra expansion would contribute to drying out the Washow Peninsula where two other new peat mine licences were approved last week. Cottagers, environmental organizations and affected First Nations have appealed these new licences thoroughly since summer 2011. When the Sunterra expansion proposal was filed under Manitoba’s Environment Act hundreds of citizens filed objections. “We expect the Crown to get to the bottom of the situation at Sunterra’s current operation, and to stop approving licences for more peat mines in our territory. This company took steps that contravene the Heritage Act when they discovered this sacred site. We expect that an archeological inventory and field work will locate other sites. This peninsula is a filter for Lake Winnipeg. Drying it out with peat mining makes no sense. Peguis First Nation members continue today to use the peat bogs as our pharmacy. We wish to protect the peat bogs and their species, and continue our traditional activities, including for hunting and medicinal plants,” said Councillor Mike Sutherland. “Manitoba Conservation and Water Stewardship, and the Crown are simply disregarding Peguis First Nation, despite being provided with our technical analysis, and knowing our Section 35, Treaty and TLE rights in this matter,” said Chief Glenn Hudson. Peguis First Nation expects work to stop at Sunterra’s peat mining operation, and an extensive archeological inventory and assessment to be conducted through the peninsula by the Crown. Traditional kwill be available from Peguis First Nation. Sunterra Horticulture Inc has applied for an Environment Act License to expand its current Peat mining operations in the Bullhead, Little Deer Lake and Ramsay Point Bogs, located 40 and 80/ km North of Riverton, Manitoba. The proposed expansion will result in approximately 1324 hectares (ha) of land clearing, with 715 hectares being mined directly. Roads and ponds will be built. The proposed peat mine expansion is located within the Traditional Territories of Bloodvein River First Nation, Fisher River First Nation, and within both the Traditional Territory and Treaty Land Entitlement Notification Area of Peguis First Nation. The expanded vacuum peat mining operation would impact Peguis First Nation’s ability to exercise its rights, including for Treaty entitlement land selection. The Sunterra expansion would contribute to drying out the Washow Peninsula where two other new Peat licenses were recently approved. Washow peninsula is a filter for Lake Winnipeg. Drying it out with peat mining makes no sense. Peguis First Nation members continue to use the peat bogs as our pharmacy. Peguis First Nation has objected to renewal of Crown land peat leases, granting of any pending peat quarry leases, and the proposed peat mine expansion for Sunterra Horticulture Inc. This mine would affect our rights, our lands and waters, while contradicting Crown’s duty to consult in a meaningful manner by providing proper notice about leases, consulting and accommodating our First Nation. There has been no accommodation or compensation to our First Nation for peat leases or mines. Peguis First Nation is preparing it’s response to the Sunterra expansion. The Manitoba government has decided to disregard the Peguis First Nation assessment of traditional use, impacts on aboriginal rights, and environmental effects from two peat mine proposals. After twenty months of licence appeals, community consultations projects, and extensive technical work by Peguis the peat mine licence appeals were refused by Manitoba Conservation. Licences were issued for two new peat mines in Peguis territory and Peguis treaty land entitlement area, February 22, 2013. The Peguis First Nation main community is located near the top of the interlake region in Manitoba. Peguis territory extends throughout the eastern Interlake, and southern Manitoba. 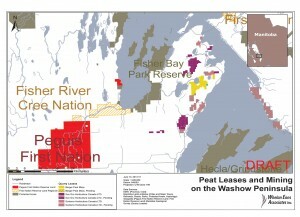 The Washow Peninsula into Lake Winnipeg is the location of the two peat mine leases and licences. Cottage communities, and a provincial park are nearby. Despite ‘stringent new standards’ for the licences, and new requirements for both Sun Gro and Berger to set up before operating the new mines, road building by Berger Peat Moss started immediately. Problems started when Manitoba did not notify or consult Peguis First Nation when issuing peat leases in the 1990s. Those leases were renewed without notification or consultation. Then Manitoba issued both peat mines an environment licence right after declaring in June 2011 a two year moratorium on new peat mines. No notification, consultation or accommodation occurred at any point either. Numerous appeals of the 2011 Sun Gro and Berger peat mine licences came from First Nations, cottage associations, and environmental organizations. Based on a work permit dated January 1, 2013, work on an all weather road by Berger Peat Moss began Tuesday, February 25. The new licences require plant studies, transplanting of endangered species, and medicinal plants, new buffers on all riparian zones, plus setting up extensive water testing and monitoring systems. Berger Peat Moss is clear cutting Manitoba forest. Manitoba Conservation issued a road building permit to Berger January 1, 2013. Berger Peat Moss’ new environment licence, issued late February, after a year and half of appeals, is for a new peat mine in Washow Peninsula on Lake Winnipeg, Manitoba. The company was road building the day after the licence was issued. Clear cutting started recently. All this is happening despite the new environment licence requiring Berger Peat Moss to file a satisfactory wildlife, habitat and vegetation inventory with Manitoba Conservation before they disturb the land. Lake Winnipeg was named most threatened lake of 2013 by the Global Nature Fund. Friday March 22, 2013 is World Water Day. Peguis First Nation, together with cottagers, property owners, and Fisher River First Nation, are blocking the road into Washow Peninsula Tuesday April 16, 2013. Berger Peat Moss Ltd ignored provisions in its environment licences for a new peat mine, and is clearing forests and road building. Their clearing and road building should not happen before the required plant study and inventory, including for medicinal plants. Despite a moratorium on new peat mines put in place June 2011 this peat mine was licensed in summer 2011. Despite many months of formal appeals of the license, and community consultations by First Nations affected by the mine proposal, new licences were issued at the end of February. Berger Peat Moss may ignore or breach its licence further. The Washow Peninsula is a ‘kidney’ for Lake Winnipeg, and provides moose habitat, medicinal plants, and a range of tourism opportunities. No notification, or consultation by the Manitoba government with affected First Nation occurred before the leases for the mine or the license for the mine. The Washow Peninsula is situated within the Treaty Land Entitlement notice area for Peguis First Nation, and is a shared traditional use area for both First Nations.